Our house sits on a half acre lot. It is not a huge lot, but using a push mower (at least for me) it takes about 2 hours to cut the front and back yard. So a couple of years ago we purchased a riding lawn mower, which honestly I am a little scared to operate. Our yard is very hilly. 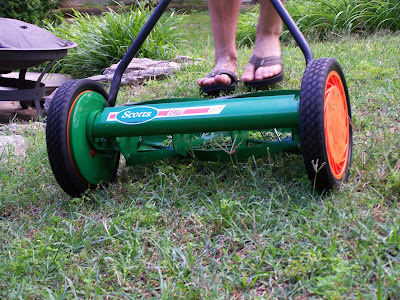 The push mower no longer works so last week my husband splurged on a reel mower to use in those hard to reach places. It is very light and easy to use. It definitely works better on grass that is not too long and you have to make sure there are no little sticks in the way. It was very gratifying to push it along hearing only a little whir as it sliced the grass. Knowing it was not using any gas just a little muscle made me feel very green. It definitely does not cut as well as a gas powered mower, but I think it will serve its purpose well. I wish I could convince my husband to push a mower than put gas in one but he is a little obsessive with the grass in our yard. I would love for my 9 year old son to learn how it used to be done also. Hey, I got them both to eat broccoli maybe a push lawn mower is next.